A plant based diet high in dietary fiber is rich in vitamins and minerals. High fiber food is also rich in vitamins and minerals. 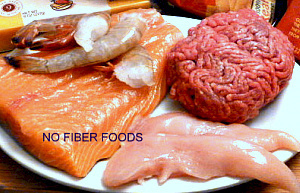 Meat, chicken, fish, dairy and eggs have ZERO FIBER. A diet of fiber rich foods will be one of consuming greens, whole grains, fruits, legumes or any type of unprocessed plant foods that have wonderful natural fiber. This huge lack of fiber contributes heavily to sickness in the U.S.A. The average American consumes only 11 - 15 Grams of fiber a day. This is inadequate for optimum health. Here we go again...the old tried and proven method of having excellent health is, as always, eating more plants! All of the good healthy stuff, including adequate fiber, is found in a plant based diet. We know now that most of us don't get enough dietary fiber. The USDA claims that you should consume 14 grams of fiber for each 1000 calories. This means that an average diet of 2000 calories a day would require a MINIMUM OF 28 GRAMS OF FIBER. Many doctors, recommending a plant based diet for excellent health, claim that 50 to 100 grams of fiber a day is not uncommon in individuals that adopt a plant based lifestyle. The Mayo Clinic recommends that women should eat at least 21 to 25 grams of fiber a day, and men should aim for 30 to 38 grams a day. If you are diabetic, you may need as high as 50 grams a day in order to eliminate excess glucose faster. If you are getting sufficient fiber you should be having 1-3 bowel movements each day. If you really want to understand the history of fiber as promoted in today's health scene, take the time to watch this 1991 interview with Dr. John McCougall and Dr. Denis Burkitt. Dr. Burkitt had a tremendous influence on Dr. McDougall's early enlightenment of the causes of disease. This 40 minute video testifies to the amazing journey of this man of faith that found his calling in serving the people of South Africa with his medical skills. His observations of the benefits of large amounts of fiber in the diets of the African people led him in pioneering the importance of a plant based diet high in fiber. Chronic sickness and disease in our western culture is largely due to the effects of too little fiber in the diet, according to Dr. Burkitt. He emphasized throughout his career that prevention is the best way to eliminate chronic diseases. you have to have large hospitals." If you have fissures, benign conditions resulting from straining, hemorrhoids, or other conditions, the information given here will help you keep your health in order during your lifetime. You should not consider fiber use a temporary thing to cure a current problem and then discontinue its use. If your condition is such that you have to introduce small amounts of fiber to begin with, then that's what you should do. You may have to overcome less than desirable reactions like excess gas, diarrhea and bloating when you first introduce additional dietary fiber into your system. Just take it slow and natural. If you are under a doctor's care, make sure he or she is aware of your program. Make sure that you drink plenty of water or other liquids to reduce the chance of intestinal blockage. Adequate liquid will help to avoid uncomfortable symptoms and improve the digestive cycle. Eight glasses of water should be a minimum intake of liquids per day. Stay away from sodas and especially diet sodas. Diet sodas are especially dangerous to your health. Instead of "Got Milk?"... "GET FIBER!" Sources of Dietary Fiber- With enough fiber in your diet, the food will pass quickly and easily through the digestive system assisting the elimination of toxins.